Values are things that are important to us. They are how we decide whether our actions are good or bad, right or wrong. They are high level generalisations that describe that which is important to you. They are a filter. They are how we decide about how we feel about our actions. They guide our every decision and therefore our destiny. Another name for values in NLP is criteria. Values is an NLP Master Practitioner subject and forms a major part of our NLP Master Practitioner Training Course. Learn the full subject and benefit from personal coaching in how to ensure that you have prioritised your own values to get what you want out of life at one of our NLP Training Courses or onilne at our NLP online training Centre. Within a context ask… ‘Whats important to you about………. ?’ – this uncovers the conscious aspect. Expect a list of about six to eight things. What else is important?’ uncovers the unconscious. Ask this twice to gain maybe three or four more things at most. Eg Within the context of your work. What is important to you about your work? What else is important? Elicit the submodalities for the value that you want to change and the value on the list that you want to move the original value underneath. Change the submodalities on the value that you want to move to match the submodalities of the value that you want to move it under. Means values are the means to get to the end – where you want to be. End value is the emotional state that you desire. Means values are the means for you to trigger the states that you desire. Towards values are when your motivation or reason for having the value is in order to move towards something, to have something positive. Away values are when your motivation is negative, to move away from something or avoid something. In discussion with the client you would use the words of the values elicited starting from the bottom up to motivate them. They guide our every decision and therefore our destiny so by changing the values you can change the way a person thinks, feels, and behaves. 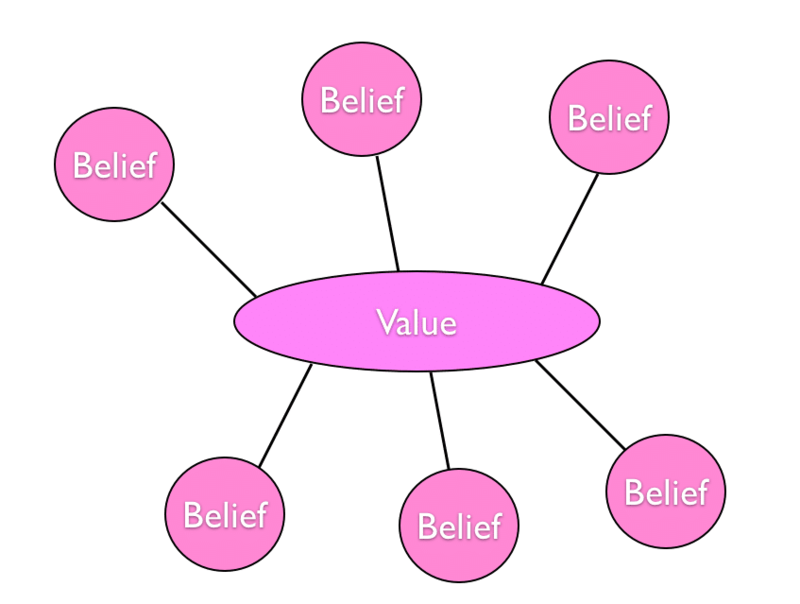 Beliefs are clustered around values. Most values tend to be unconscious, beliefs are conscious. Beliefs are the convictions that we generally hold to be true, usually without actual proof or evidence. Beliefs are basically assumptions that we make about the world and our values stem from those beliefs. Our values are things that we deem important and can include concepts like – equality, honesty, education, effort, perseverance, loyalty, faithfulness, conservation of the environment and many, many other concepts. 2.Values are ideas that we hold to be important. 4.Beliefs and values determine our attitudes and opinions. Motivation to run a behaviour is governed by our values, how we run that behaviour is derived from our metaprogrammes. Metaprogrammes are the keys to the way a person processes information. They are internal patterns that help determine how we form our internal representations and direct our behaviours, the internal programmes we use in deciding what we pay attention to. Metaprogrammes are unconscious processes in the same way that values are unconscious and they are both filters that help us delete distort and generalise our experiences. Values are central beliefs expressed through specific behaviours and emotions are feelings linked to specific behaviours. If your values are met then you will achieve your desired emotion. More in our NLP e-Learning centre.